Some businesses in Manhattan only provide one bathroom on premise, which is unisex within the office. The toilet and sink are located inside this single occupant private bathroom. 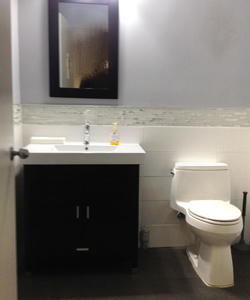 It is not uncommon for an office to feature two or mor private restrooms today! A private restroom is a restroom located with the office space and only accessible to the business. 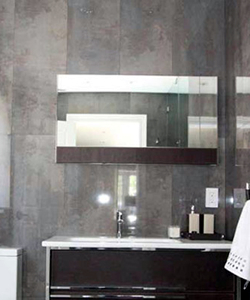 An en-suite restroom is located within the office and only available to the occupier of the office. A shared restroom is a restroom located on the floor of the office space and is shared amongst the tenants of the floor. A single-occupancy restroom are added in smaller spaces to meet any requirements. In larger spaces, single-occupancy restrooms are added for convenience or privacy. In en-suite restrooms, the restrooms must allow for accessibility. There are requirements for the door, grab bars, and the sink height. The space should allow any alterations to make the space fully accessible to any person using the restroom. Using the workplace restroom can cause anxiety and a lack of privacy. A lot of unease is contributed to the space between the door and partition, the restroom pilaster. Relieving yourself among co-workers and bosses can also contribute to the restroom anxiety. The single-occupancy toilet is a great solution to assist in avoiding awkward restroom situations instead of the room with rows of stalls separated by the metal partitions. This is also a great option for transgender and gender non-conforming individuals looking for gender-neutral restrooms. The single-occupancy restroom tend to be improbable for many larger office floor plans. A larger company would need too much space to house all the necessary restrooms. Let alone finding a restroom unoccupied. Occupational Safety and Health Administration guidelines require a certain number of restrooms per number of employees. Office spaces with 15 employees or less must have at least one restroom. An office with 110 employees are required to have a minimum of six restrooms. Restrooms are counted as usable rentable square feet especially in a situation where a renter occupies a full-floor. In a full-floor situation, the useable square feet is counted by the boundaries of the building excluding stairwells and elevators. Janitorial, mechanical and electrical rooms may also be included. Private restrooms and other common areas (hallways, pantries, and reception areas) are typically found within the boundaries. If you are on the market for a new office space that includes private restrooms, we will help you find the perfect space for your business. Give us a call anytime – we are happy to answer your questions and assist in your search for commercial space.